Once again it’s time for Jamon and Q to wrap up the current season of The MJCast podcast, have a little break to recharge, and then come back with our next season in the new year. Without you all tuning in to our little podcast, we wouldn’t be able to do what we do, so thank-you for listening! Jamon and Q start this episode with a wrap up of the past year at The MJCast and it’s been a big one! They share their favourite moments as it proves too hard to pick just one each. 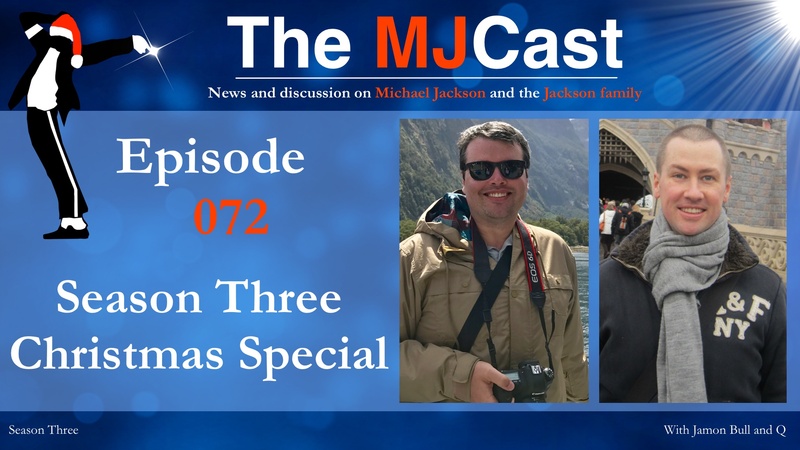 The boys then offer their final news segment for 2017, covering Paris Jackson’s covershoot and interview for L’uomo Vogue, the recent trademark filings of the Michael Jackson Estate and 2018 concert date announcement for 3T in Italy and France before hearing directly from Jackson Family Correspondent Janneke of Jackson Source about Jermaine Jackson sharing the stage with his sons Jaafar and Jermajesty. Jaafar Jackson also features in the current issue of D’Scene magazine. Wrapping up 2017 news, the fellas cover the recent announcement that The Estate and Sony have extended their business partnership results in an expected response from MJ fans the world over and the newly released Blood on the Dancefloor X Dangerous extended mix. Ending on some good news, Jamon and Q explore the latest development in the Wade Robson molestation allegation court case, which has resulted in a dismissal! Our Season Three highlights reel features clips from our special episodes this year, with appearances by Tito Jackson, Michael Prince, CJ DeViller, Remixed by Nick*, Ryan Michaels and Charles Thomson, Isabelle Petitjean, Brice Najar, Jonathan “Sugarfoot” Moffett, Vincent Paterson, Hector Barjot, Joseph Vogel, Ola Ray, and most recently, Andy Healy, and Chris Lacy. Then, what’s next for The MJCast? Jamon and Q drop some hints! Again, thank-you for your support and listenership of The MJCast, it’s been a heck of a ride this year, but we appreciate you being with us for the journey, and look forward to bringing you a new season in 2018. Merry Christmas to you and your loved ones, and best wishes for a wonderful 2018 new year! If you have any thoughts, opinions, or feedback on the show, we’d love to hear from you. Contact us at themjcast@icloud.com or find the links to our many social networks on www.themjcast.com. Keep Michaeling!